“Pffft” sez I, “I can do that!” Turns out it isn’t as easy to be random as you’d think it would be. Don’t get me wrong…I make scrap quilts all the time, and I have no problem combining fabrics within the quilt that just “don’t go together.” However, the fabrics almost always coordinate with in the individual blocks. So, I can do “wild.” It’s the “abandon” I will have to work on. While I was playing, I came up with a block to show you. It finishes 10″ square. For each 10″ (finished) block you will need four 4.5″ squares. Mine match, but yours do not have to. You will need a total of seventeen 2.5″ squares. I have eight lavender, four deep red, four splattered, and one orange. If you want to throw caution to the wind, just make sure you have one medium value square, four dark squares, and the remaining fourteen squares should be light. 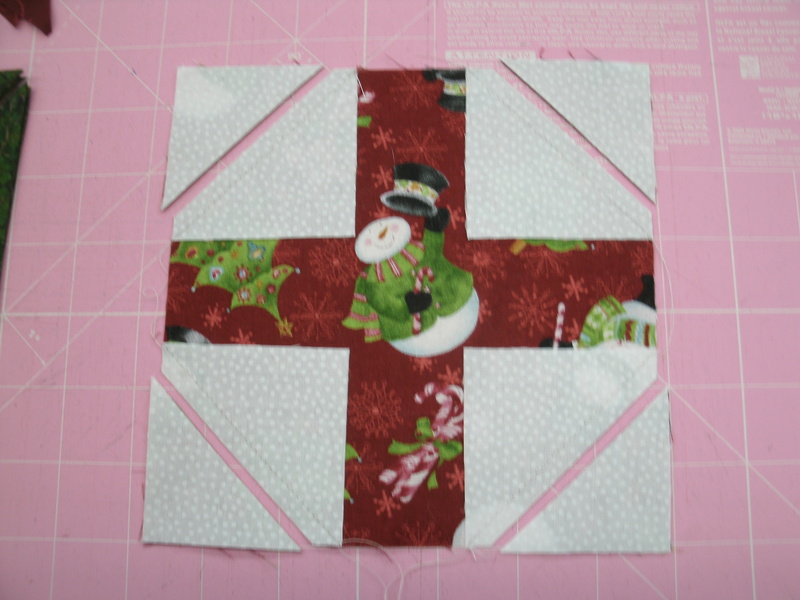 Use the stitch-n-flip method to put light triangles on two opposite corners of each of the 4.5″ squares. Set these squares aside. 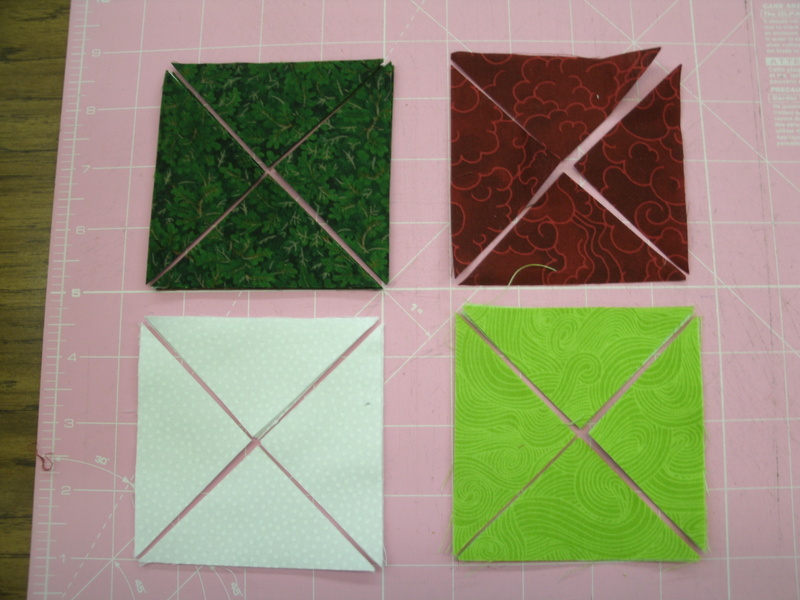 Sew four light 2.5″ squares to four dark 2.5″ squares. In the end, I chose Option 2, though I’m pretty fond of Options 1 and 4. This is why I am never bored, for every quilt I make, I come up with several more ideas. Fortunately, my scrap bin overfloweth! I’m going to give you two options for this block. The first is a two-leaf version that finishes 10″ square, and the second is a 12″, four-leaf version like the photo above. 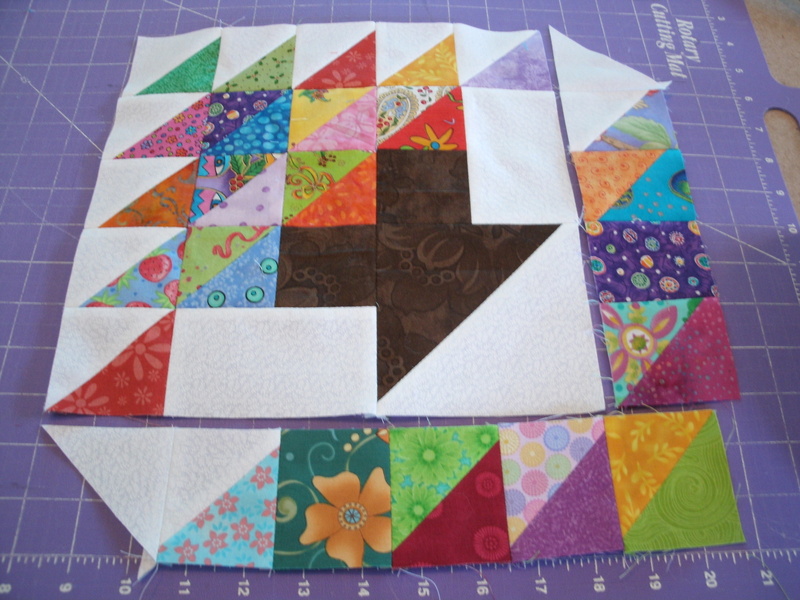 Step 1 – Use the stitch-and-flip method to put small triangle corners the 4.5″ blossom squares. 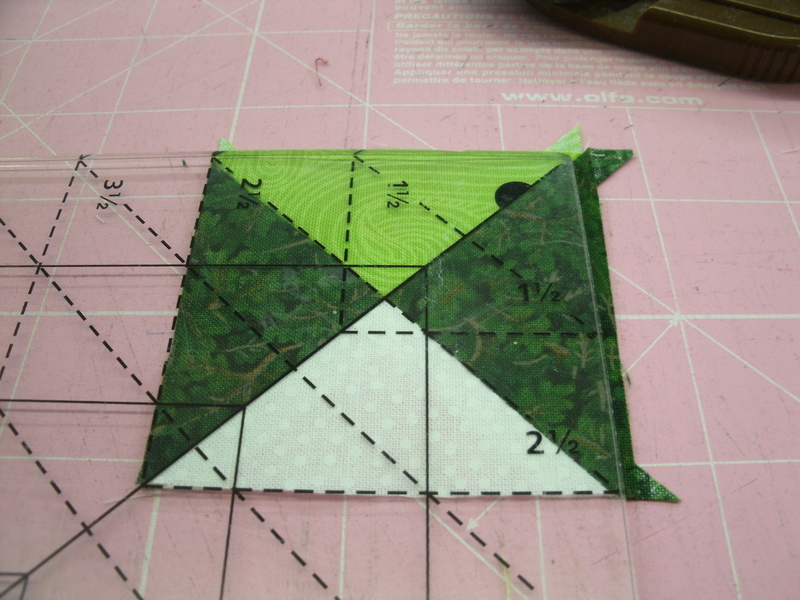 To do this, lay a 2.5″ square on the corner of the larger square and draw a diagonal line as shown in photo 1a. Sew on the line and trim off the corner 1/4″ from the seam as in photo 1b above. Press the corner open, and repeat on the opposite corner (photo 1c). Make one “petal unit” with two white corners. Make one petal unit with two green corners. Make two petal units with one white corner and one green corner. Use the same stitch-and-flip technique to put one yellow corner on each petal unit. Note that on the green and white petal units, the yellow corners need to be on opposite ends, as shown above. Now you can sew the four petal units together as shown to make the blossom. Set aside while we make the leaf units. 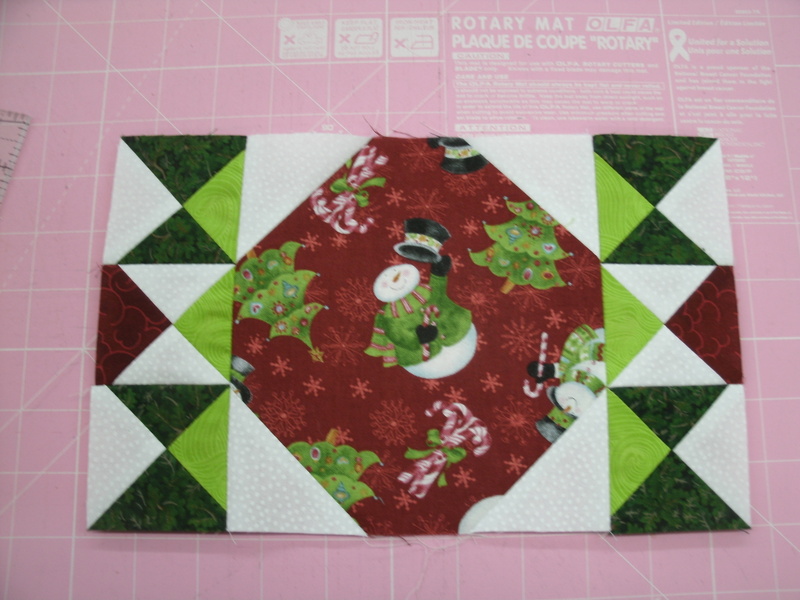 Step 2 – Use 2.5″ x 4.5″ background rectangles and 2.5″ green squares to make two flying geese units with the stitch-and-flip technique. 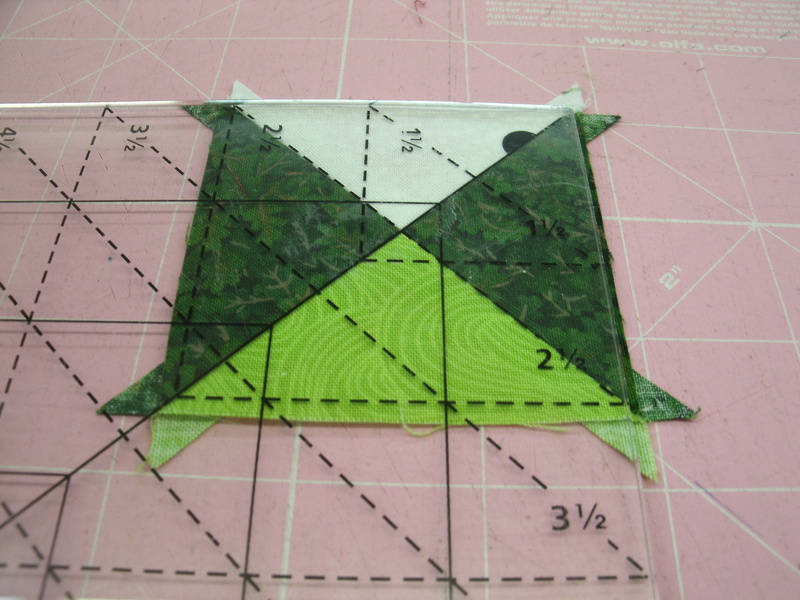 Sew 2.5″ background squares to both end of of one flying geese unit. 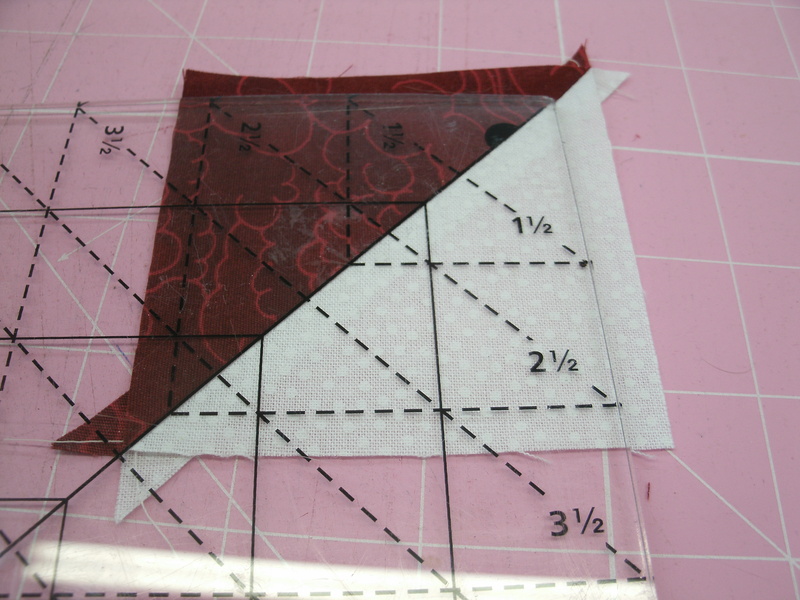 Sew a square to the right end of the other unit, and a 2.5″ x 4.5″ rectangle to the left end. Sew the shorter leave unit to the left side of the blossom unit. Sew the longer leaf unit to the bottom of your blossom to complete the 10″ Little Wildflower block. I also made a 12″ version, with four leaves. For the larger block, all of the petal units have two green corners and one yellow. 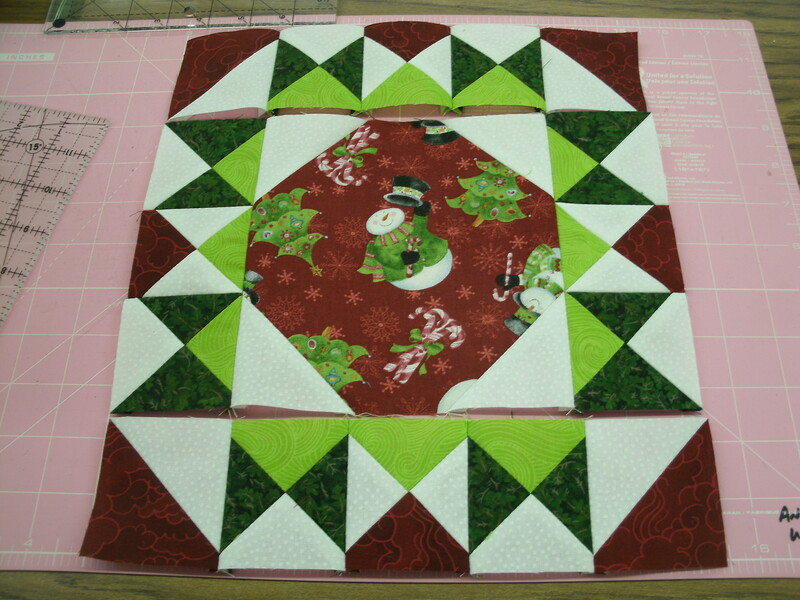 For the 12″ block, make four green and white flying geese units. 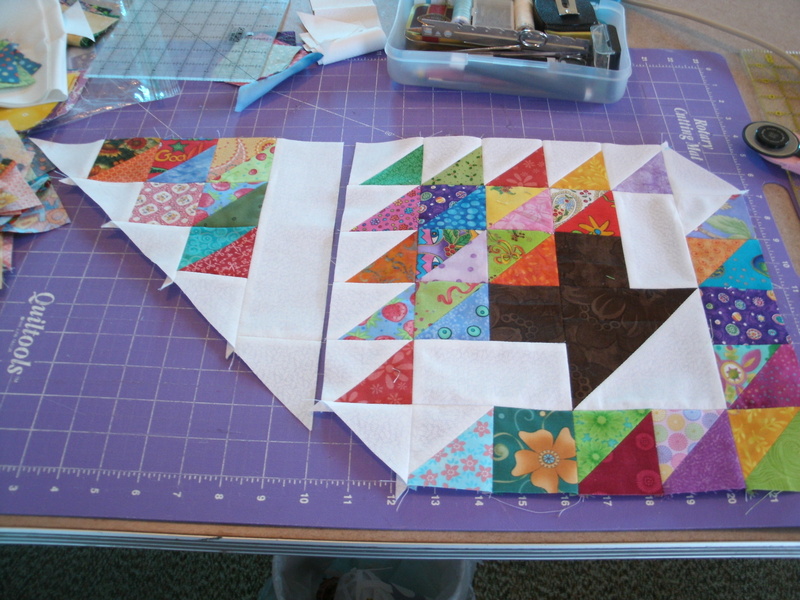 Sew background squares to the end of two geese, and background rectangles to the ends of the other two flying geese. Sew the shorter leaf units to opposite sides of the blossom unit. Sew the longer leaf units to the top and bottom to complete the 12″ Little Wildflowers block. You know the best part about being a designer? It’s seeing what other people do with my designs. I love the autumn colors, Chris, and can’t wait to see the red, white and blue version! It’s harvest time in Montana’s Golden Triangle, and from the accounts I’ve heard, it’s a bountiful harvest. Nature’s “white combine” -hail- did claim a share, but as I drove home the 60 miles from Inverness to Shelby (after a day of quilting with friends), I saw dozens of combines hard at work, and a parade of trucks hauling wheat to the big elevator in Chester. A lot of hard work is paying off. My overflowing scrap basket is a testament to hard work, too, and as I was picking out fabric bits and sewing this tablerunner project, I was reminded of dozens of projects these scraps came from…a quilt for a new family menber and Project Linus and for a service member returning from overseas, samples for classes, patterns and demonstrations at my local quilt shops and guilds. So many memories, that will now be right there on the table, reminding me to give thanks for a full plate, and a full life. 70 2.5″ Half Square Triangles (HSTs) that have two prints. We will be building this tablerunner by making two end units and a middle unit. This tablerunner will have two Overflowing Scrap Basket blocks, one at each end. To make the trim pieces, sew two strips. 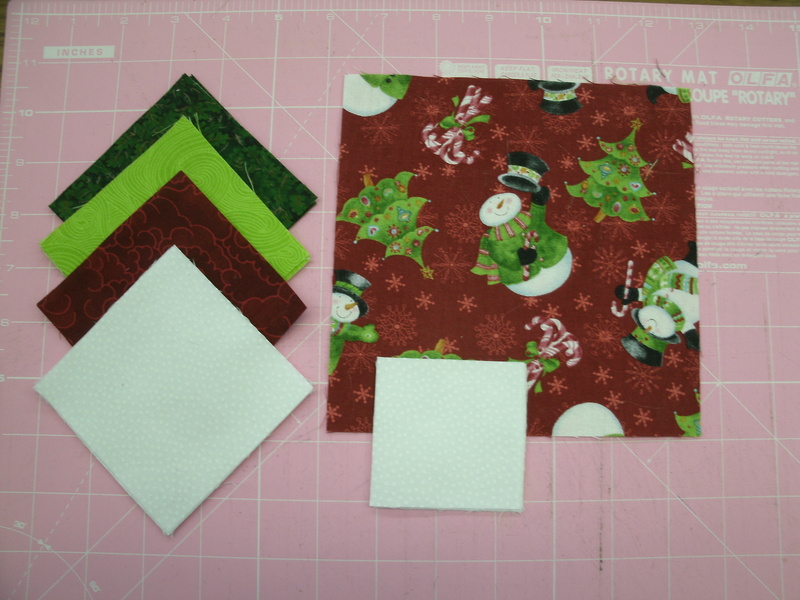 The first is three print/print HSTs, a print/white HST and a white triangle. Sew the is strip to the lower right side of the basket block as illustrated. 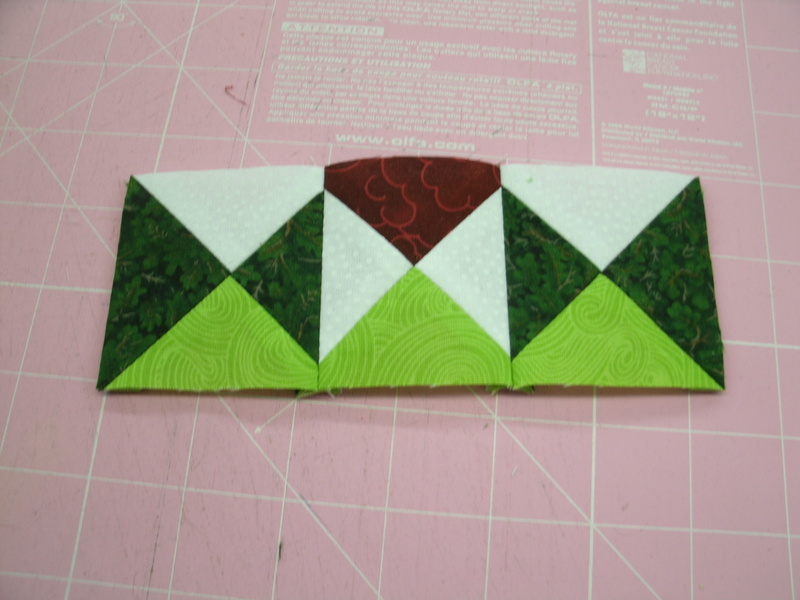 The second strip is four print/print HSTs, one print/white HST and a white triangle. Sew this strip to the lower left side of the basket block. Do this for both blocks. Next we need to piece a triangle unit. You will make two of these units. 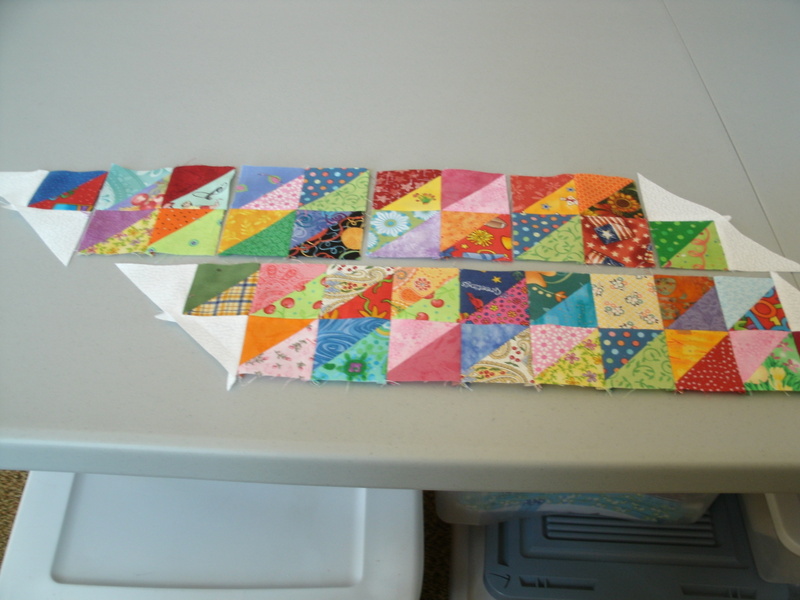 Build this triangle by sewing two white triangles to adjoining sides of one HST. 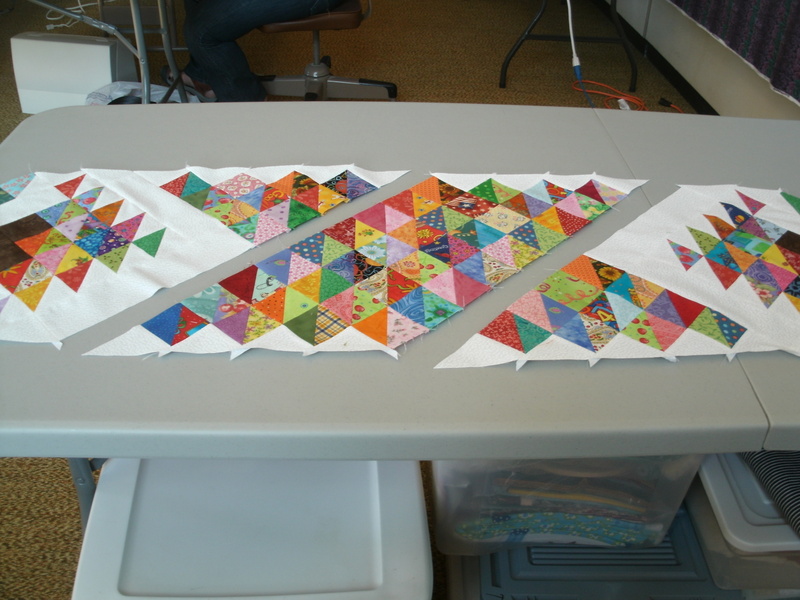 Then sew two HST’s together and add a white triangle. The third row has three HSTs and a white triangle, and the fourth row is the 2.5″ x 8.5″ white strip with a white triangle at one end. 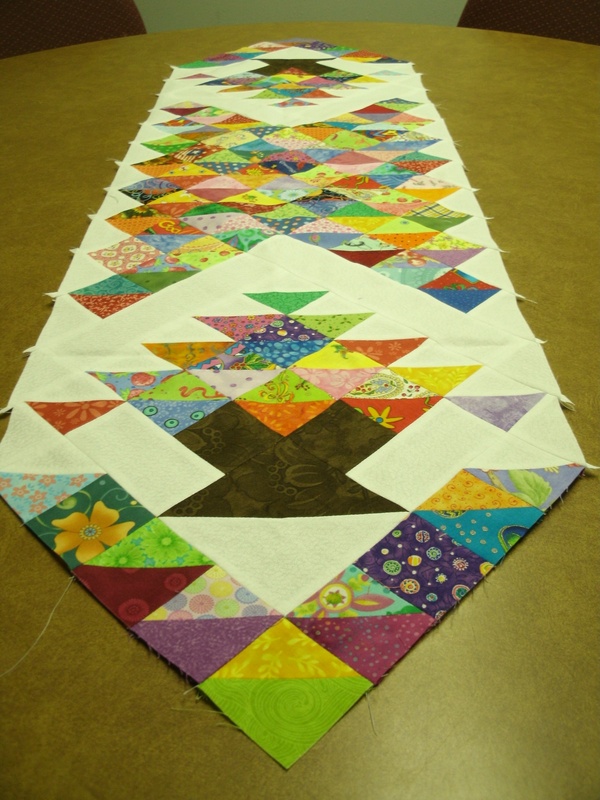 Sew these four rows together to make the large triangle unit shown. 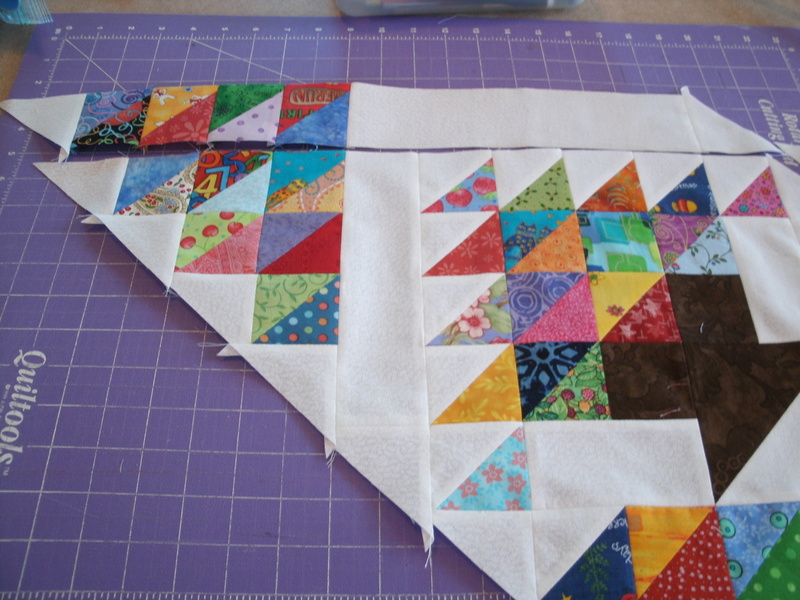 Make two of these triangle units, and sew them to the LEFT side of your blocks. 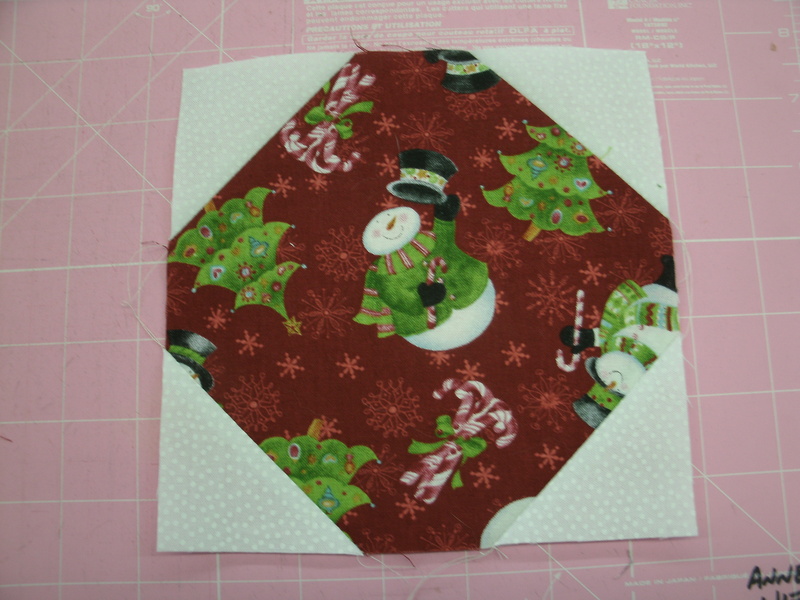 Sew four HSTs together and add a white triangle at one end. 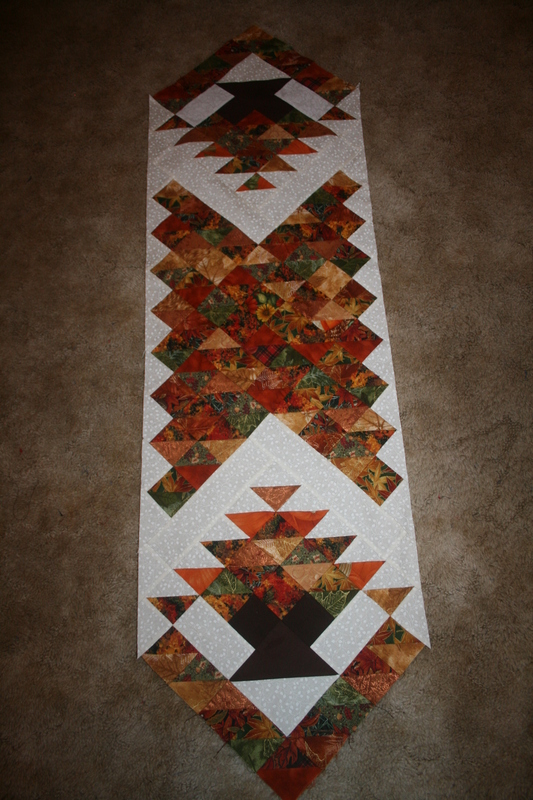 Sew the 2.5″ x 10.5″ white strip to the HST’s and finish with another white triangle. Sew this strip to the RIGHT side of the basket block. The two end units are complete. Set them aside while we make the center unit. Sew four strips with nine HST’s in each strip. Add a white triangle to each end of all four strips. Sew the strips together as shown. 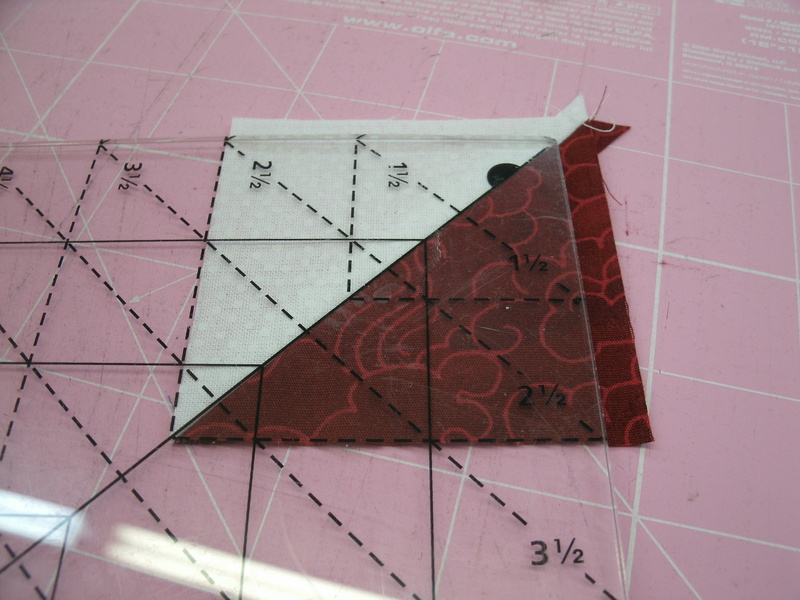 Lay out your center and end sections as shown and sew together to complete your tablerunner top. The piece should measure approximately 15″ x 54″. If you looked closely at my finished top, you may notice that all of the HST’s are sewn do that their center seams run the same direction. You do not have to worry about that if you don’t want to…I did a fair amount of “frog stitching” (rippit) because it is easy to get those HST’s turned around. You may also notice that I mixed in just a few full 2.5″ squares. I admit it…I got bored making HSTs! In fact, if you wanted to, you could do the whole thing (except the baskets) with 2.5″ squares. I’d love to see a photo of your tablerunner. You can email it to me at: anne@sweetgrassdesigns.com.